You probably know the legend of the majestic, antlered deer that live in the North Pole. You may even know that reindeer exist outside of Christmas stories. But did you know that there are actually people who live among reindeer? In the far northern reaches of Scandinavia, Finland, and Russia lives a group of people who thrive in frigid temperatures. These people, who have herded reindeer for about 10,000 years, are called the "Sámi". Sámi ancestors lived much like the Native Americans did on the plains. Both groups lived in extreme temperatures and lead nomadic lifestyles. 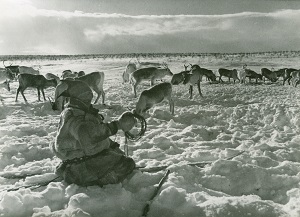 Today, some Sámi still lead a traditional herder lifestyle and use reindeer for clothing, blankets, food, and tools. Aside from modern all-terrain vehicles (ATVs) and snowmobiles, a minority of today's Sámi herd reindeer the way those in their culture have done for thousands of years. They even remain on their ancestral lands. But not every Sámi herds. In reality, over 70,000 Sámi live in Scandinavia today, but only a few families still tend reindeer. Many have instead assimilated—some voluntarily and some not—to the modern world. More recently, however, there has been a revival of ancient Sámi culture. Previously, government-ordered “Norwegianization” policies banned the speaking of the native Sámi tongues and forced assimilation. Today, many Sámi have begun to speak their languages again. Yet, these languages are still only spoken by a Sámi minority. Other parts of the Sámi culture, including gákti clothing, lavvu tents, and reindeer herding, have also begun re-dominating many modern Sámi people's ways of life. With preservation of tradition and care, this unique culture will carry into the next generation. Perhaps Sámis to come will fully choose to embrace the ways of their ancestors over the appeal of modern lifestyles.